Digital features in medical publications: Where are we now? Caroline Halford, Digital Publishing Manager at Springer Healthcare, presented key findings from a short survey of publishing professionals working in around MedComms and the pharmaceutical industry, looking at perceptions and experiences of digital features to accompany medical publications. Caroline also discussed readership trends in medical publishing, Adis's experience of digital features, metrics, and how to maximise return on investment. Once again we lined up a panel of experts for the discussion and the emphasis in the meeting was on encouraging the audience to ask questions and share their own experiences. This meeting was supported by Blue Sky eLearn. Hosted by Blue Sky eLearn, this interactive session discussed the current outlook on digital features in medical publications, looking at the both the benefits and possible difficulties. Caroline started the session reporting the results of a short survey, released in February, looking at perceptions and experiences of digital features in medical publishing. In total, 132 individuals from around the world completed the survey, of which the majority (59%) worked in MedComms. Respondents generally felt that videos and animations were the most useful and valuable digital features, as well as being the most impactful for HCPs. 62% of those that completed the survey had been involved in the publication of digital features and when individuals were asked why they decided to do a digital feature, the most common answer was "pharma initiative" (56%). 32% developed a feature following journal invitation but only 6% created a digital feature following author initiative. Perhaps surprisingly, the vast majority (81%) of respondents said that they did not measure return on investment (ROI) of the feature or publication. Overall, 97% of those that had previously published an enhanced digital feature would do it again (as it was valuable and added impact) and 96% of those who hadn't yet created a digital feature for publication said that they would be interested in doing so in the future. As Digital Publishing Manager for Adis, Caroline then drew on her own experiences regarding the publication of digital features within the Adis Rapid+ portfolio of journals and the increasing activity in this area. Adis Rapid+ journals actively promote digital features as they offer a different way to digest information and data and have the ability to summarise data in a concise and easily digestible way. Following a recent internal analysis, Caroline showed that Adis articles with digital features have higher downloads than those published in the same time period without digital features. In summary, digital features have the ability to broaden the reach of articles and increase their overall impact. If digital features are used correctly, they can have a great ROI. Using a previous example, Caroline explained that enhanced content has previously been used in press releases and shared on social media to show the key data. Following on from this, 64% of those that completed the survey (full details above) reported that they used social media to disseminate the published article and digital feature. Recent feedback also showed that 43% of people that had not yet published a digital feature had said this was the case as they had not been invited to do so. This highlights the importance of journals and publishers to actively promote their capabilities when it comes to enhanced digital content. The key challenges in digital feature publication that people mentioned were related to technical difficulties, compliance, cost and timing. The panellists agreed that digital features should help readers understand the content quickly and easily, making them want to read the full article. In this sense, it is very important for these features to add additional value to the publication. All panellists agreed that it can be difficult to measure ROI on digital features. From personal experience, Daniel explained that it is possible to use click through rates, conversion rates and analyse the time that viewers have spent on a feature to measure ROI. However, Debbie suggested that it may more beneficial and interesting to look at the metrics and downloads for the article itself rather than the accompanying enhanced feature(s). All in all, it can be very difficult to fully understand what ROI metrics actually mean and often this can be a fairly time consuming process. As an alternative, Cliff suggested that it may be beneficial to include a user survey at the end of digital features for readers to complete in order to access value and provide qualitative insights. Is there a chance of increasing the divide between sponsored and non-sponsored papers? There is a concern that digital features may impact on the divide between pharma and non-sponsored papers with non-pharma papers being unable to afford the creation of these features. However, the panel all disagreed and Caroline stated that this had not been the Adis experience and many non-sponsored digital features had been published in the portfolio. Daniel followed this highlighting that the creation of digital features does not necessarily have to be a costly exercise. Using a phone, webcam, microphone and PowerPoint, audio slides can be created simply without any cost. Debbie fully agreed stating that audio slides can be very cost-effective. Rather than cost, it may be that authors do not feel they have the time to create this additional material. Cliff agreed that this could be this case and offered an efficient solution of setting up a video booth at conferences to create digital features. With this in mind, the panellists felt it was important for journals to educate authors and provide easy ways for the authors to create these features to publish alongside their articles. To minimise compliance issues and possible cherry-picking, it is important for digital features to match the full article and to be treated as part of the publication (undergoing both internal reviews as well as peer review). If these are adhered to, and if considerable efforts are made to be fair and accurate, digital features should not increase cherry-picking in medical publishing. An additional concern around misinformation exists with regards to the publication of digital features. There are fears that information from these platforms may be shared on social media out of context. However, it was recognised that it is normally the authors and publishers that share these features on social media and that all authors should approve the digital feature before publication. Furthermore, the panellists suggested that digital features may in fact decrease the chance of misinformation as the content is more freely accessible (published online and often open access) so readers can easily refer back to the original article and source material. The session was brought to a close with panellists agreeing that it would be difficult to do a like for like comparison to show correlation and the significance of digital features. 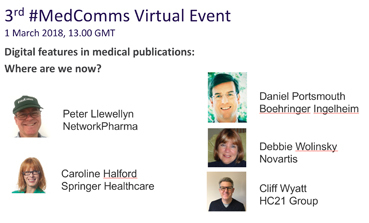 Although it would most probably require collaboration, all panellists felt that it would be both interesting and important to do such a comparison to access the true impact of digital features in medical publishing. Thank you and congratulations to NetworkPharma, BlueSky eLearning, all panellists and attendees for a successful and informative webinar.